Recent advances in ultra-high-power lasers, including the free-electron laser, and impressive airborne demonstrations of laser weapons systems, such as the airborne laser, have shown the enormous potential of laser technology to revolutionize 21 st century warfare. Military Laser Technology for Defense , includes only unclassified or declassified information. The book focuses on military applications that involve propagation of light through the atmosphere and provides basic relevant background technology. It describ es high-power lasers and masers, including the free-electron laser. Further, Military Laser Technology for Defense addresses how laser technology can effectively mitigate six of the most pressing military threats of the 21st century: attack by missiles, terrorists, chemical and biological weapons, as well as difficulty in imaging in bad weather and threats from directed beam weapons and future nuclear weapons. 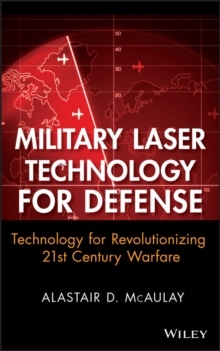 The author believes that laser technology will revolutionize warfare in the 21st century.